When the Affordable Care Act was first implemented, it required that all employer-provided health insurance plans include contraceptive coverage at no cost to employees. This mandate required coverage of both preventative contraceptive methods, such as birth control pills, and emergency contraceptive methods, such as Plan B. However, religious organizations are automatically exempt from administering the coverage due to their religious objections to contraceptives. Similarly, nonprofits with religious affiliations have the option to certify their objection and be permitted to opt-out of administration. In order to still provide coverage for the employees of such approved groups, the Obama Administration created a separate system, known as the accommodation process, through which insurers are solely responsible for administering the mandate on behalf of exempt employers. The Burwell v. Hobby Lobby ruling expanded the accommodation process further to include “closely held” for-profit companies who certified that covering contraceptives violated their “sincerely held” religious beliefs. In Hobby Lobby, the majority argued that there was no meaningful distinction between such corporations and the exempt non-profit organizations––requiring a company to provide contraceptive coverage to which its owners had religious objections violated the Religious Freedom Restoration Act, regardless of its for-profit status. Would the exemption . . . extend to employers with religiously grounded objections to blood transfusions (Jehovah’s Witnesses); antidepressants (Scientologists); medications derived from pigs, including anesthesia, intravenous fluids, and pills coated with gelatin (certain Muslims, Jews, and Hindus); and vaccinations (Christian Scientists, among other)? . . . Not much help there for the lower courts bound by today’s decision. Justice Ginsburg also identified an important distinction between for-profit corporations and other exempt groups, writing, “Religious organizations exist to foster the interests of persons subscribing to the same religious faith. Not so of for-profit corporations. Workers who sustain the operations of those corporations commonly are not drawn from one religious community.” Hobby Lobby implicated women whose work had nothing to do with religion (beyond the personal ideologies of their boss’s boss’s boss) and opened the gates for further limitations on the contraceptive coverage mandate. Despite the growing list of exempt employers, the mandate still significantly expanded access to affordable birth control. Under the Affordable Care Act, more than 55 million women gained access to contraceptives,  a particularly important step for low-income women who otherwise were priced out of controlling their own reproductive health. In addition, the mandate substantially contributed to lowering average out-of-pocket drug costs for those with large employer-provided insurance: oral contraceptives alone accounted for 63% of the decrease in out-of-pocket costs since 2012. These benefits are exceedingly significant to the lives of Americans across the country and should not be discounted. The Trump Administration is currently working to further expand exemptions to the birth-control mandate, arguing for employers’ broad rights to deny women contraceptive coverage. The new policy allows for even publicly traded corporations to object to covering birth control in their employee insurance plans based on either religious or moral obligations. Under these changes, all organizations with religious objections (whether non-profit or for-profit) and all non-profit and non-publicly traded for-profit employers with moral objections will be automatically exempt. In addition, the Trump Administration is working to weaken the accommodation process on the grounds that it still places too much of a burden on employers with religious objections to contraceptives. The new policy also eliminates the requirement that employers notify the federal government if they stop covering contraceptives. 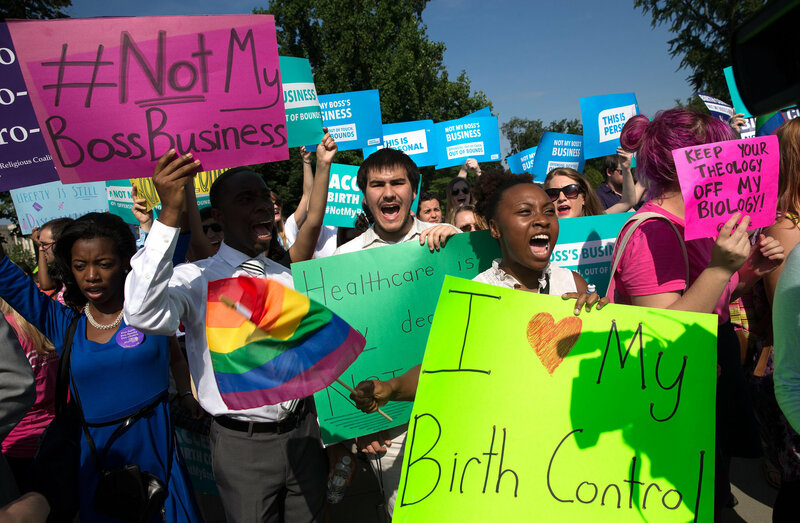 The Administration’s logic for these moves stems from Zubik v. Burwell, a 2016 Supreme Court case in which religious non-profit organizations argued that the accommodation process rendered them complicit in the distribution of birth control, even though it moved the coverage obligations from their hands to a separate process run by their insurer. Zubik was remanded to discover whether there was a process less burdensome on employers by which employees could still access birth control. Following a year-long investigation into alternatives, no good replacement seemed to be available. Based on this conclusion, the Trump Administration decided to weaken the accommodations process by allowing employers to autonomously decide whether their employees can receive independent coverage, concluding that a tenuous religious freedom argument trumps the autonomy and health of women across the country. These policy changes target the core of the contraceptive coverage mandate, chipping away at American women’s ability to control their reproductive health choices. Because courts generally do not question the bona fides of “sincerely held religious beliefs” and because the new policy includes exemptions for moral objections as well, the Trump Administration’s changes will allow almost any company to shirk their obligation to provide contraceptive coverage. On top of the massive expansion of exempt employers, the Trump Administration’s destruction of the accommodations process will vastly limit the opportunities for women to get coverage through other methods. Under the new regulatory scheme, hundreds of thousands of women could lose access to birth control. The Administration itself projects that women will have to pay $18.5 million out-of-pocket annually for contraceptive care after losing coverage. These impacts will be felt most harshly by low-income women who cannot afford contraceptives without the coverage from their employers or alternative insurers. Without a successful fight against President Trump’s new policies, the mandate will lose much of its influence. The Litigation Fight: Will the Mandate Survive? Following the release of the changes to the exemption standards and the accommodations process, Attorneys General and advocacy groups across the country filed lawsuits fighting the new policies. Below is a brief analysis of the major legal arguments. Administrative Procedure Act: Under the Administrative Procedure Act, the federal government has an obligation to disclose its process for changing policies. According to the Attorney General of California, the changes to the contraceptive coverage mandate were “jammed through” without sufficient notice and comment. There were no public meetings with women’s or healthcare organizations, and there was no opportunity for states to communicate the implications of the policy changes. In addition, the Administration did not supply the necessary factual and legal basis for their policy changes, which are particularly important because the changes “undermine the fundamental guarantees in the ACA for women’s healthcare.” Because of these failures to provide notice and allow for comment, the proposed new policies are invalid. Establishment Clause of the First Amendment: Opponents to the Trump Administration’s new policies have argued that the government is violating the First Amendment ban on government action “respecting an establishment of religion.” Courts have interpreted the Establishment Clause to prohibit the government from favoring “one religion over another, or religion over irreligion” The Attorney General of California argues that the new policies create exemptions that are so broad they cross over from reasonably protecting religious beliefs to actively endorsing them. By enacting the changes, the government is “allow[ing] employers to use religious beliefs as a right to discriminate against employees to deny them a federally-entitled health benefit.” In fact, the federal government is employing its power to advance religious beliefs over the autonomy of women, particularly by changing the accommodation process to allow for employer-veto over access to a separate insurance system. Similarly, the ACLU argues, “While religious freedom gives us all the right to our beliefs, it doesn’t give institutions or individuals the right to impose their beliefs on others or to discriminate.” The harm of such a right would be “constitutionally impermissible,” according to the Attorney General of Massachusetts, because it imposes substantial burdens on those who will lose coverage. Allowing non-religious employers to force their religious beliefs upon their employees with little oversight and without providing an alternative goes beyond the government’s obligation to protect religious freedom. Equal Protection Clause of the Fifth Amendment: According to the lawsuit filed by the Attorney General of California, the changes to the contraceptive coverage mandate violate the Equal Protection clause of the Fifth Amendment because they specifically “target and harm women” without lawful justification. Preventative reproductive services were added to the ACA in order to target disparities in healthcare costs between genders. The Massachusetts Attorney General’s lawsuit highlights that contraceptive coverage is an instrumental category of healthcare for women; it reduces unintended pregnancies, decreases adverse pregnancy outcomes, lowers risk of cancer, treats menstrual disorders, and above all, allows women to control their own reproductive health choices. While preventing access to medically necessary care for women, the Trump Administration has left coverage for men essentially untouched. As a result, the policy changes unjustly limit women’s equal access to preventative medical care. “Immediate and Irreparable” Harm to the States: Finally, the State of California’s lawsuits argues that the policy changes will have massive fiscal and administrative implications for the states. When the women who gained contraceptive coverage under the Affordable Care Act suddenly find themselves without a federally-administered benefit, they will revert to the state systems, overburdening them. Some women who are not able to overcome the financial and administrative burdens of losing their ACA contraceptive coverage will be left without birth control, leaving the states to cover future financial burdens from unintended pregnancies and other adverse health outcomes associated with a lack of access to contraceptives. For example, in California the state-level system will have to respond to the approximately 13 million women who received contraceptive coverage under the ACA and who may no longer be covered once the broad exemptions are put into place. In order to protect state interests and the well-being and fundamental rights of women living within their borders, the Trump Administration must withdraw its proposed policy changes. Denying access to contraception is denying women access to healthcare. Trump’s rule change to give employer’s [sic] a veto over a woman’s ability to plan for her future and her family is a cruel policy, and not one dollar of taxpayer money should go towards implementing it. No other medical treatment is restricted the way contraception is, which not only cuts against women’s constitutional rights, it causes harm for the many women who use it to treat everything from acne to menstrual cramps. For them, and the millions of other women who use birth control every day, we must stop this rule from causing any more harm. The Trump Administration’s policy changes will have immeasurable effects on women—and on men—across America, and we must work to preserve the invaluable protections created under the Affordable Care Act. See Michael Nedelman et al,, Major Blow to Obamacare Birth Control Mandate, CNN (Oct. 6, 2017), http://www.cnn.com/2017/10/06/health/trump-birth-control-mandate/index.html [https://perma.cc/K26M-FJN2]. See Birth Control Benefits and Reproductive Health Care Options in the Health Insurance Marketplace, HealthCare.gov, https://www.healthcare.gov/coverage/birth-control-benefits/ [https://perma.cc/GHK6-4ZLL] [hereinafter Birth Control Benefits]; see also Amy Goldstein, Juliet Eilperin & William Wan, Trump Administration Narrows Affordable Care Act’s Contraception Mandate, Wash. Post (Oct. 6, 2017) https://www.washingtonpost.com/national/health-science/trump-administration-could-narrow-affordable-care-acts-contraception-mandate/2017/10/05/16139400-a9f0-11e7-92d1-58c702d2d975_story.html [https://perma.cc/6FGL-7NZ6]. See Birth Control Benefits, supra note 2. See Complaint for Declaratory and Injunctive Relief at 10, Massachusetts v. U. S. Dep’t of Health & Human Servs., No. 1:17-cv-11930 (Oct. 6, 2017), http://www.mass.gov/ago/docs/press/2017/contraception-rule-complaint.pdf [https://perma.cc/KM95-RCKS] [hereinafter Mass. Complaint]. Burwell v. Hobby Lobby Stores, 134 S.Ct. 2751, 2759 (2014). Id. at 2805 (Ginsburg, J., dissenting). See id. at 2795 (Ginsburg, J., dissenting). See Robert Pear, Rebecca R Ruiz & Laurie Goodstein, Trump Administration Rolls Back Birth Control Mandate, N.Y. Times (Oct. 6, 2017), https://www.nytimes.com/2017/10/06/us/politics/trump-contraception-birth-control.html [https://perma.cc/L9CZ-UM2A]. See Cynthia Cox et al., Kaiser Family Found., Examining high prescription drug spending for people with employer sponsored health insurance (2017), https://www.healthsystemtracker.org/brief/examining-high-prescription-drug-spending-for-people-with-employer-sponsored-health-insurance/#item-start [https://perma.cc/QQ9F-JT3P]. See Pear, Ruiz & Goodstein, supra note 11. See Goldstein, Eilperin & Wan, supra note 2. See Mass. Complaint, supra note 5, at 12–13. See Complaint for Declaratory and Injunctive Relief at 2, California v. U.S. Dep’t of Health & Human Servs., No. 3:17-cv-05783, (Oct. 6, 2017), http://big.assets.huffingtonpost.com/BecerraBirthControlComplaint10617.pdf [https://perma.cc/SNL8-XNRG] [hereinafter Cal. Complaint]. See Mass. Complaint, supra note 5, at 11–12. In Justice Ginsburg’s dissent, she mentioned that there is an “overriding interest” in “keeping the courts ‘out of the business of evaluating’ . . . the sincerity with which an asserted religious belief is held.” Burwell v. Hobby Lobby Stores, Inc., 573 U.S. 1, 34 (2014) (Ginsburg, J., dissenting). See Mass. Complaint, supra note 5, at 15. Organizations suing the Trump Administration over the new contraceptive coverage policies include the National Women’s Law Center, the Center for Reproductive Rights, Americans United for Separation of Church and State, the American Civil Liberties Union, and the Attorneys General of Washington, California, and Massachusetts. See David Crary, Lawsuit Targets Trump’s Rollback of Birth-control Mandate as Notre Dame Plans to End Coverage, Chicago Tribune (Nov. 3, 2017) http://www.chicagotribune.com/news/nationworld/midwest/indiana/ct-lawsuit-trump-birth-control-notre-dame-20171102-story.html [https://perma.cc/8JRB-MM5C ]; Brandon Carter, Washington AG Files Lawsuit Against Trump for Rollback of Birthcontrol Mandate, Hill (Oct. 9, 2017), http://thehill.com/homenews/state-watch/354635-washington-ag-files-lawsuit-against-trump-for-rollback-of-birth-control [https://perma.cc/3JWM-6H4Z]; Press Release, Center for Reproductive Rights, Center for Reproductive Rights Announces Challenge to Trump Administration’s Contraceptive Coverage Rules (October 10, 2017), https://www.reproductiverights.org/press-room/center-for-reproductive-rights-announces-challenge-to-trump-Contraceptive-Coverage-Rules [https://perma.cc/SF8G-SBJB]. See Press Release, State of California Department of Justice, Attorney General Becerra Challenges Birth Control Regulation Rollback, https://oag.ca.gov/system/files/attachments/press_releases/Fact%20Sheet%20-%20Birth%20Control%20Litigation.pdf [https://perma.cc/69Y4-9XFZ]. See States’ Notice of Motion and Motion for Preliminary Injunction, with Memorandum of Points and Authorities at 16, California v. U.S. Dep’t of Health & Human Servs., No. 3:17-cv-05783 (Oct. 6, 2017), https://oag.ca.gov/system/files/attachments/press_releases/PIFILED.pdf [https://perma.cc/9QEB-YEW7][hereinafter Cal. Motion]. See State of California Department of Justice, supra note 24. See Cal. Motion, supra note 25, at 17. See Mass. Complaint, supra note 5, at 23. Challenges to the Federal Contraceptive Coverage Rule, American Civil Liberties Union, https://www.aclu.org/challenges-federal-contraceptive-coverage-rule [https://perma.cc/L6DE-FKBJ]. See Cal. Complaint, supra note 17, at 18. See Mass. Complaint, supra note 5, at 8. See Cal. Complaint, supra note 17, at 2. See Catherine Pearson, Democrats Introduce Bill To Fight Trump On Birth Control Mandate, HuffPost (Oct. 19, 2017), https://www.huffingtonpost.com/entry/democrats-introduce-bill-to-fight-trump-on-birth-control-mandate_us_59e8e623e4b061a7badb026e [https://perma.cc/Z4CX-4L83]. Press Release, Congresswoman Judy Chu, House Leaders on Women’s Rights Introduce Bill to Protect Access to Birth Control (Oct. 19, 2017), https://chu.house.gov/media-center/press-releases/house-leaders-women-s-rights-introduce-bill-protect-access-birth-control [https://perma.cc/EQ9M-68L3]. Men benefit from women’s access to contraceptives directly through pregnancy prevention and indirectly through economic and societal improvements from the advances in women’s education and employment that occur partly as a result of access to birth control. See Educational Attainment, Employment, and the Benefit of Birth Control in America, The National Campaign to Prevent Teen and Unplanned Pregnancy, https://thenationalcampaign.org/sites/default/files/resource-supporting-download/getting-the-facts-straight-chapter-5-unemployment-educational-attainment.pdf [https://perma.cc/9S47-EGNV].